The best Rocky Road recipe! As a fashion and lifestyle blogger I try to make sure I post what I would like to see, and that's variety. I used to post recipes all the time, but as the fashion side of my blog grew the recipes seemed to disappear. However they're back, and if you've not been able to guess already I've got a pretty special rocky road recipe to share with you, what's even better - it's veggie friendly. In this recipe I popped a load of the smooth caramel and Belgium chocolate popcorn from Joe and Seph's* on top and I think it added a really amazing crunch to it. 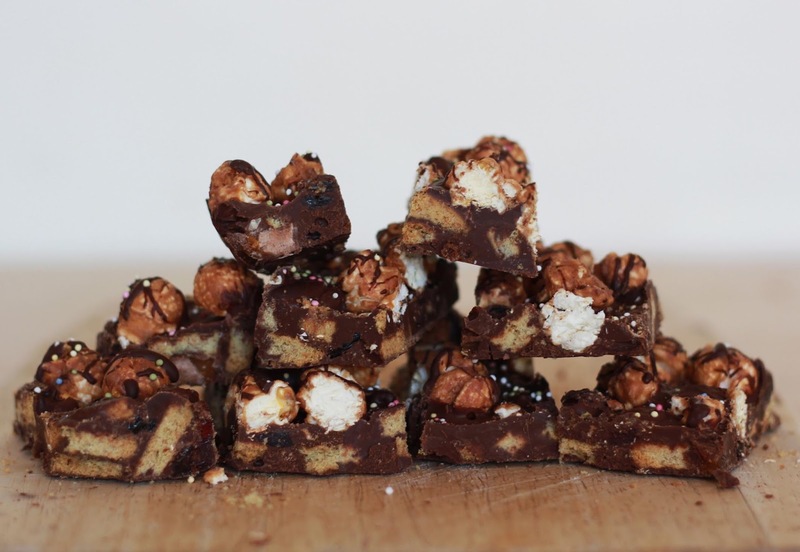 I substituted the marshmallows with a Mars bar which creates a nice softness in the rocky road and it means that no little piggies were hurt in the making of these. 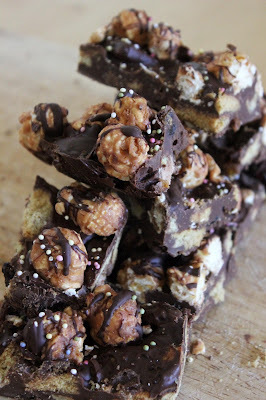 A bit of a bonus for all of you vegetarian rocky road lovers out there! 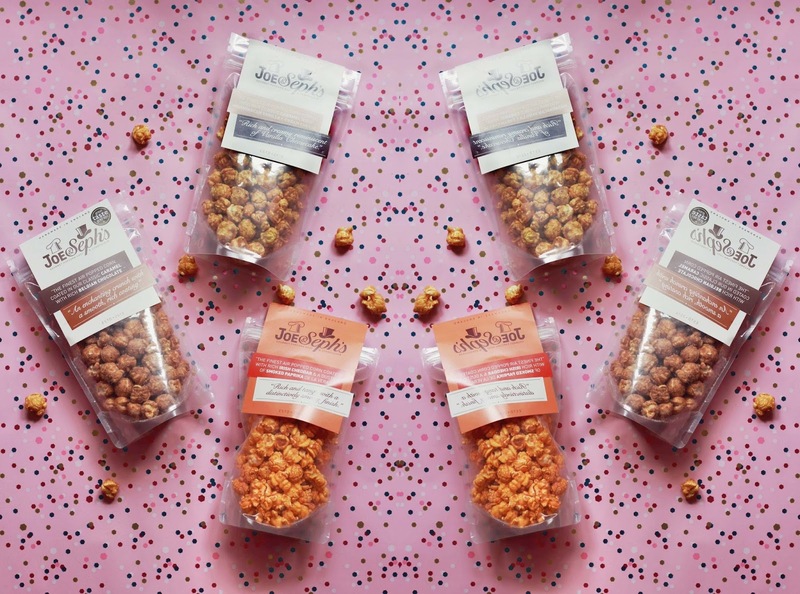 I was kindly sent a few of the popcorn pouches from the brand and I've included my favourite flavours in the photo below (one of which was the inspiration behind the post)! I loved the cheese and paprika, vanilla cheesecakes and the smooth caramel and Belguim chocolate flavours. I'm still yet to try their legendary gin and tonic flavour, I think it would be a great thing to serve at a summer picnic or BBQ. Other options you could pop in are; Maltesers, Snickers, nuts, cranberries or even coconut flakes. Line a medium sized square baking tray with cling film. I didn't have one of these so I just used a pie dish. Feel free to use anything you like, just make sure it's not too big and that it's deep enough. Break up your biscuits into chunks. You don't need to be careful with this I just snapped the biscuit in half a few times and found this size worked well! Create a bain-marie and melt the chocolate slowly on a low temperature, or simply pop in the microwave for a few seconds a time. Make sure you stir your chocolate each time to ensure it's melting evenly. Take your biscuits, mars bars, fruit and any other tasty treats you are using and and combine with the chocolate mixture. Stir well to ensure everything is completely covered. 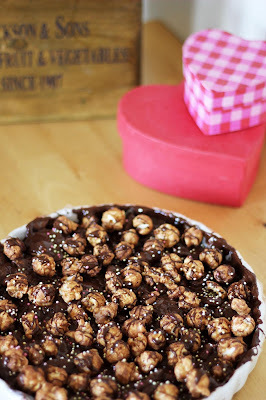 You will need to keep a little bit of the melted chocolate to one side to drizzle on top. Tip the mixture into the lined dish, and spread the mixture out into the corners. 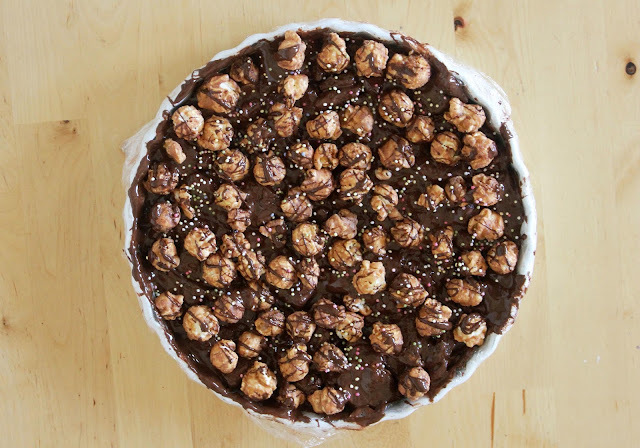 Lightly press your popcorn pieces on top, drizzle on the remaining chocolate with a spoon and finally scatter over your hundreds and thousands. Refrigerate for at least 2 hours then cut into fingers or squares, serve and most importantly enjoy! If you do! You must let me know! Hahaha, this comment did make me chuckle! This sounds and looks amazing! I mean, Mars bars, chocolate, AND popcorn. It can't get any better. I know! It tasted pretty darn good if I do say so myself.